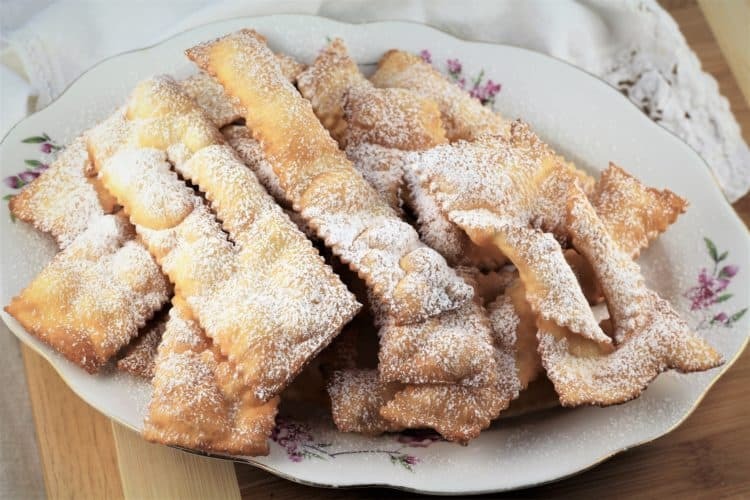 Chiacchiere di Carnevale are a typical sweet made during Carnevale in Italy, or Mardi Gras as we refer to it. I’m sharing with you my easy step by step method for making Chiacchiere! 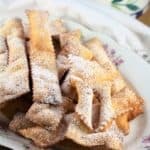 Have you noticed how most Carnevale sweets are fried? There are so many of them including Cassatelle with Ricotta (which incidentally I chose to bake instead) and others similar to doughnut balls covered in sugar. One by one I’ll get to them all! Chiacchiere di Carnevale are yet another one of those fried treats. Chiacchiere in Italian means chit chat or gossip. I’m not certain as to why they are called as such but I can imagine chit chatting with family and friends as I gobble these up! 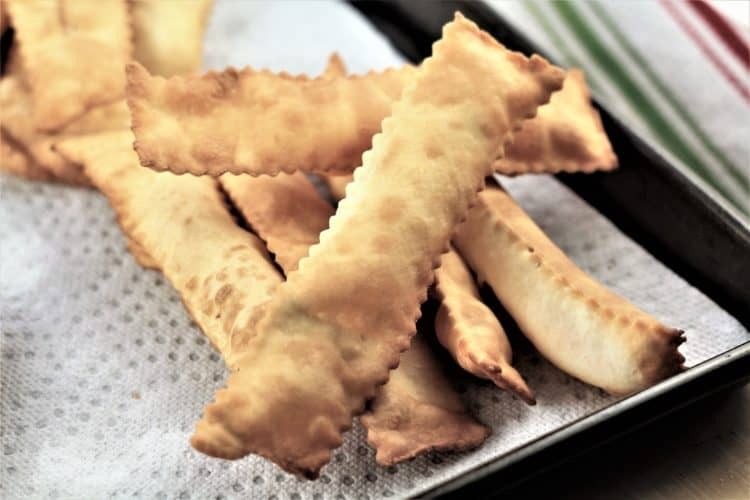 Chiacchiere puff up immediately when placed in the hot oil and the result is a crispy, not at all greasy bite that is as addictive as chips. I’m speaking from experience ’cause every time I pass by that container on the counter I stop to take just one more! What is Carnevale and how is it celebrated? I suppose it’s no coincidence that Carnevale is celebrated with lots of fried sweets when you take into consideration that Carnevale marks the beginning of Lent. Therefore, a final day of indulgences before the more solemn period of Lent begins is a must. Back in my parents hometown in Naso (Sicily), Carnevale is celebrated with face painting, costumes, parades and of course lots of sweets. My cousin informed me that these chiacchiere are one of the most popular desserts. 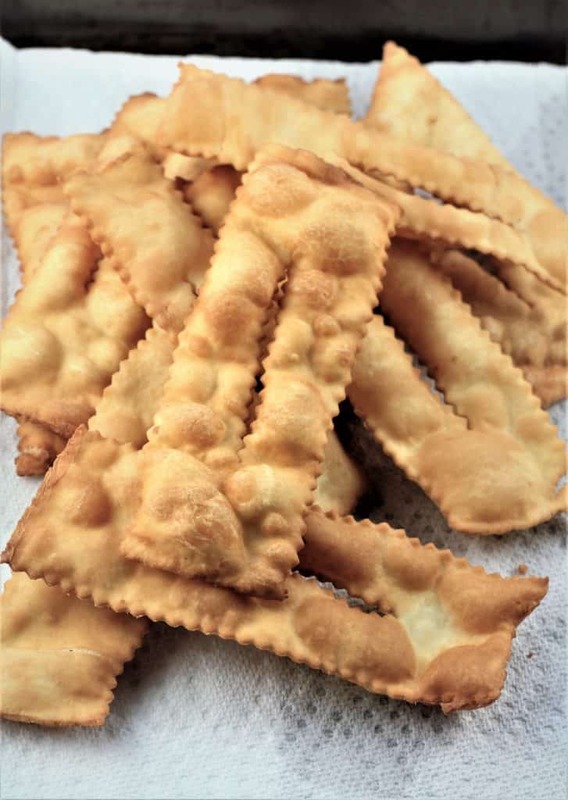 Chiacchiere are called by several different names depending on the region in Italy where they are made. This includes frappe, crostoli, cioffe and several others. No matter what they are called the idea is always the same. 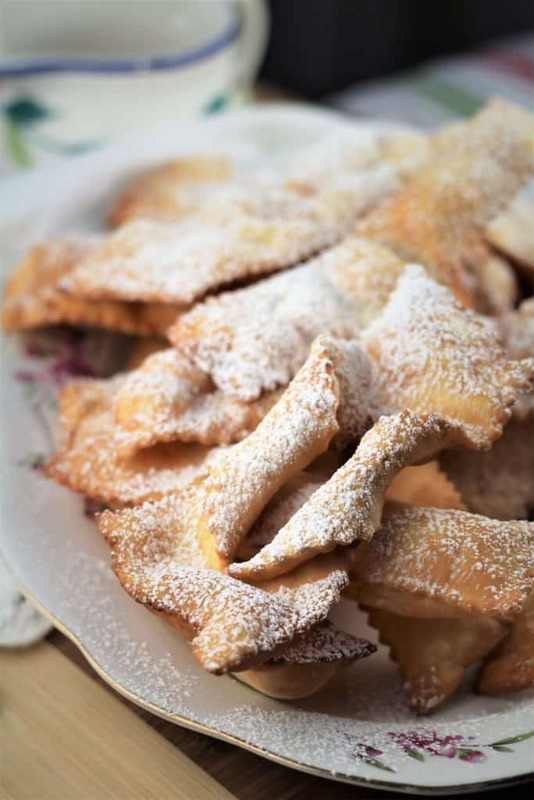 Thin sheets of dough are cut into strips, fried and dusted with powdered sugar. 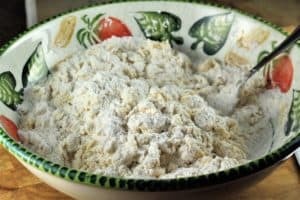 The dough for chiacchiere is quite similar to a pasta dough. I begin by making a mound of flour combined with the baking powder and sugar. Cubed butter is cut into the flour. I like to use my hands to do this but you can use a pastry cutter if you prefer. 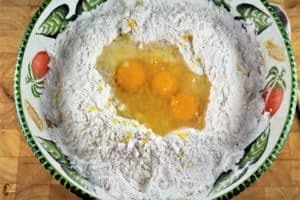 Make a well in the centre of the flour and add the eggs, grappa (or other alcohol of your choice, see note below) and lemon zest. Use a fork to gently beat the eggs and incorporate the flour into the egg mixture to begin shaping a dough. Turn the mixture on a lightly floured surface and knead the dough until smooth, about 10 minutes. The dough may appear dry but do not add extra liquid. It will become more supple and easy to handle after it rests. Cover and let rest on the counter for an hour. Cut the dough into 4 pieces, keeping the pieces you are not working with covered to prevent the dough from drying. 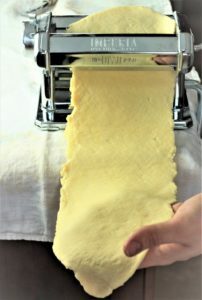 Flatten the dough with the palm of your hand and pass through the widest setting of your pasta roller. I pass the dough through this first setting several times, folding the dough lengthwise a few times until it turns out smooth. Roll the dough through the pasta roller until the second to last setting. Cover the sheet of dough to prevent from drying while you roll the remaining pieces of dough. 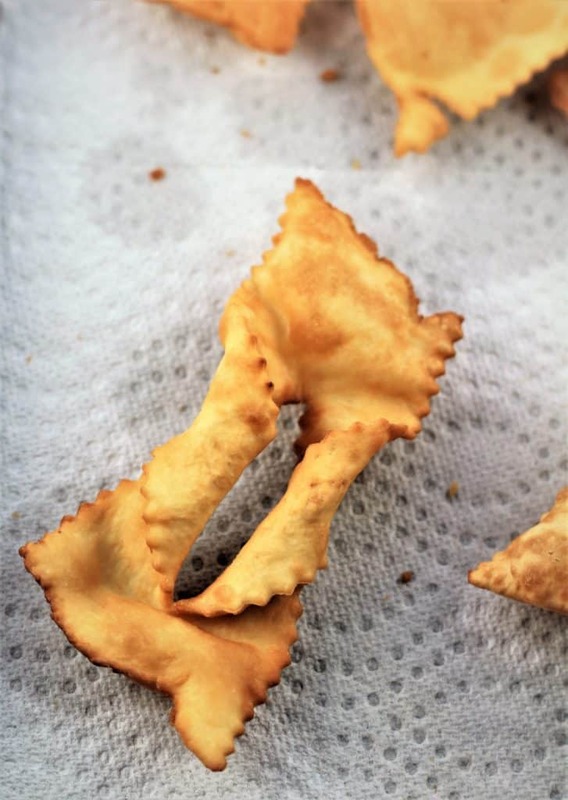 Chiacchiere can be made in various shapes using a fluted pastry wheel to get those lovely scalloped edges. Here are shapes I tried and I’ll share with you which I recommend most. Simple strips: this was my least favorite shape. When I tried to flip them over during frying to brown the opposite side, they kept flipping over. Needless to say I burned a few of these! Slit in the centre: I’ve always wondered why chiacchiere were shaped this way and now I understand why! Cut into rectangular shapes. The width does not really matter, they can be thin (about an inch) or wider, up to 2 inches. Cut a slit in the centre as shown. These chiacchiere were the easiest to fry. When turned over to brown the opposite side they did not flip back on their own. Therefore you have even coloration when frying and this is the shape I recommend. Threaded: Chiacchiere fry quite fast so I didn’t get a chance to photograph this one before frying! Cut with the slit in the centre, as shown directly above. Next, simply thread one end through the slit in the centre and pull gently to open it up. Although, aesthetically I like this shape I still found the ones above easier to fry. Fill a wide, deep pan with about an inch or two of vegetable oil. Heat oil on high heat. When the oil is hot, add the strips of chiacchiere. They will immediately puff up. Turn over and brown the opposite side. This literally takes seconds. After the oil heats up, you will have turn the temperature down to medium high to prevent them from burning. Do not overcrowd the pan or you’ll have difficulty keeping up with flipping the chiacchiere before they become too dark! They must be a light golden color. Let them cool and dust with powdered sugar to serve. 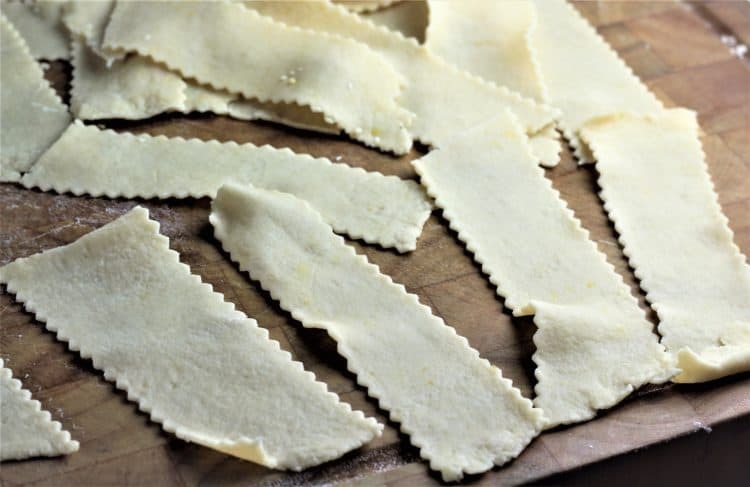 The dough dries out fairly quickly so be sure to keep the dough covered at all times, whether it be the unrolled dough, sheets of rolled dough or the cut strips of chiacchiere. Chiacchiere can be made using various types of liqueur such as grappa, brandy, marsala or even white wine. In Sicily, marsala is commonly used, but since I did not have any on hand, I used grappa. Chiacchiere fry very quickly and must be flipped to brown the opposite side. Fry a few at a time and do not overcrowd the pan for best result. Since chiacchiere are dry, they keep well for a while in a well sealed container at room temperature. Mine have been on my counter for 4 days and are still crisp. Chiacchiere can be frozen. Simply defrost and dust with powdered sugar before serving. Now you’re ready to begin your Carnevale celebration by enjoying Chiacchiere and coffee as you chit chat with friends and family! Let me know how your chiacchiere turn out by tagging me with your lovely photos on Facebook or Instagram with #mangiabedda or @mangiabedda. 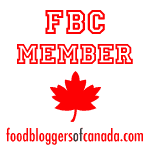 Don’t forget to share the recipe on Pinterest as well! Happy Carnevale to all! 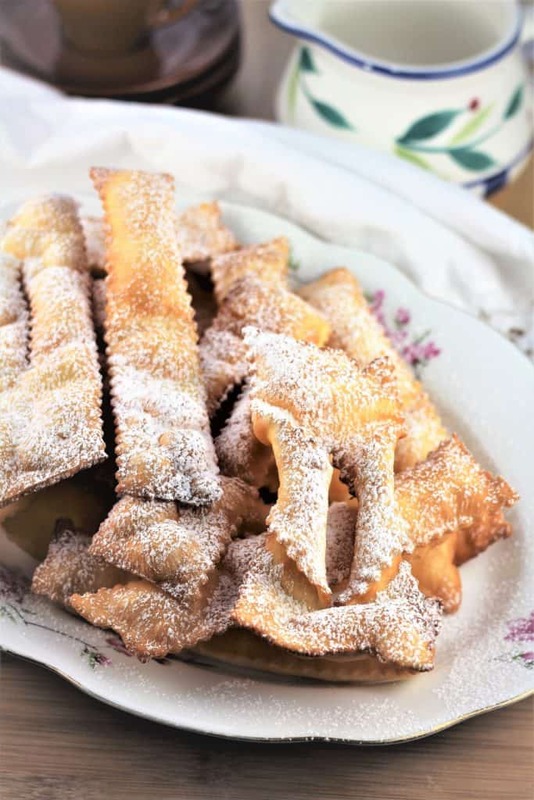 Chiacchiere di Carnevale are strips of dough that are fried and dusted in powdered sugar commonly served during Carnevale in Italy. These crispy little treats are as addictive as chips! 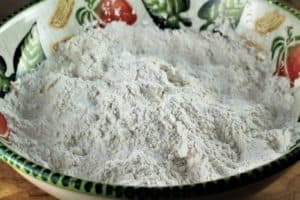 In a large bowl or directly on your work surface combine flour, sugar and baking powder. Cut in cubed butter using your fingers or a pastry cutter until evenly distributed throughout the flour mixture. Make a well in the centre and add eggs, grappa and lemon zest. 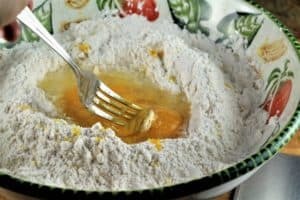 Use a fork to gently beat the eggs and begin incorporating the flour into the egg mixture to make a dough. 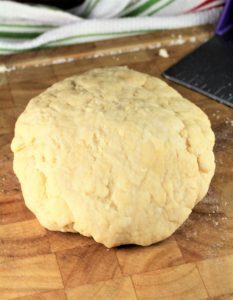 Transfer the mixture onto a lightly floured surface and knead until a dough is formed. This will take about 10 minutes. Cover with plastic wrap and let sit at room temperature for 1 hour. After an hour, cut the dough in 4 pieces. 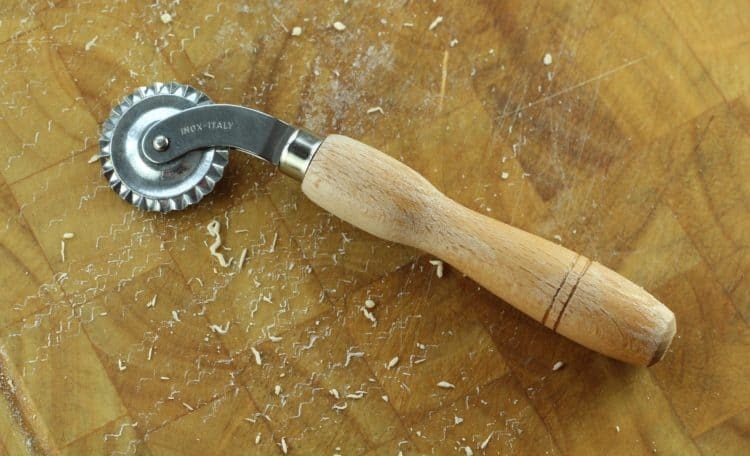 Flatten a piece of dough with the palm of your hands and roll through the pasta roller set at the widest setting. Roll a few times, folding the dough over lengthwise until it comes out smooth. Continue rolling, reducing the width of the rollers until you have reached the second to last setting. Cover the sheet of dough to prevent from drying and roll the remaining pieces of dough. 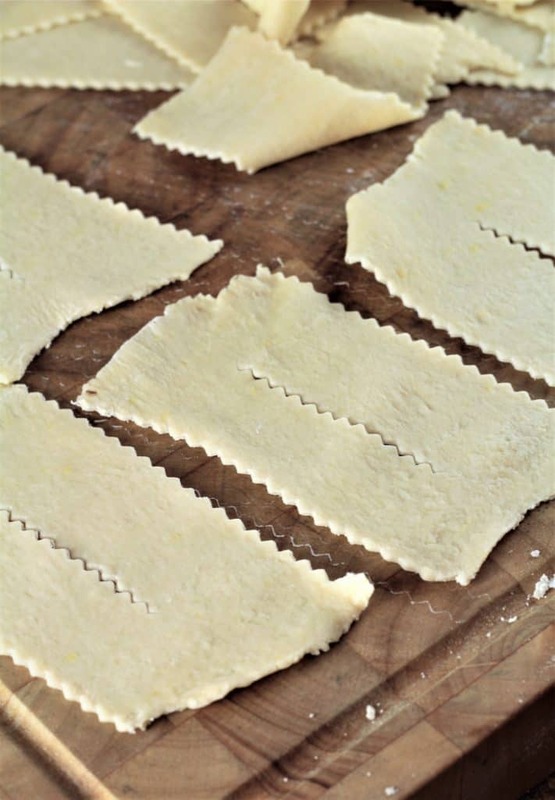 Using a fluted pastry wheel cut into strips. Fill a wide, deep pan with 1 to 2 inches of vegetable oil. When the oil is hot, place a few strips of dough in the pan. When one side is browned flip over to brown the opposite side. This will take a few seconds, therefore do not overcrowd the pan. Transfer to a paper towel lined baking sheet to cool. Once cooled, dust with powdered sugar and serve. Please note that the nutritional information offered may vary according to the exact size of the chiacchiere you make. Thank you Angie, and they're so addictive too. I have to stop going into the kitchen to get just one more! Thanks Frank! Of course it doesn’t have to be Carnevale to enjoy these, they’re delicious any time of year!